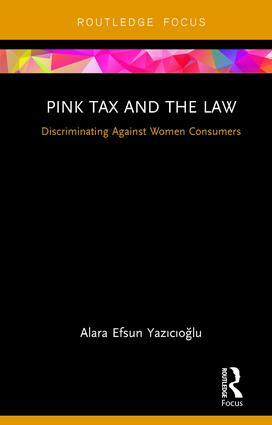 The emergence of the terms ‘pink tax’ and ‘tampon tax’ in everyday language suggests that women, who already suffer from an economic disadvantage due to the gender wage gap, are put in an even more detrimental position by means of ‘discriminatory consumption taxes’. This book is the first conducting a legal analysis to establish to what extent this public perception is accurate. Does the practice of ‘pink tax’ effectively amount to a tax in the legal sense? Does the so-called ‘tampon tax’ genuinely constitute an anomaly within the general consumption tax system? Most importantly, can these two ‘taxes’ be legally qualified as discriminatory? This book provides scientific answers to these questions. It first cuts through the existent information clutter by elucidating the pertinent economic, sociological and psychological components of the practices referred to as ‘pink tax’ and ‘tampon tax’. It then proceeds with a thorough legal analysis of all relevant aspects to determine whether women are indeed subject to discriminatory consumption taxes. It is well-established that women earn less than men. This book investigates if they simultaneously pay more due to ‘discriminatory consumption taxes’. Dr. Alara Efsun Yazicioglu is an assistant professor and an attorney at law. She is specialized in tax law and sports law. She worked formerly as a senior attorney at PwC Turkey, as a legal advisor at Oberson Avocats (Switzerland) and as a teaching and research assistant in tax law at the University of Geneva (Switzerland). She has publications on various aspects of tax law and sports law, including a co-authored practical cases book (Droit fiscal suisse et international: Recueil de cas pratiques) published by Helbing Lichtenhahn Verlag.